Will GMO/Bioengineered Labeling Hurt Food and Beverage Sales? Home / Articles / 2019 / Will GMO/BE Labeling Hurt Food and Beverage Sales? Considering the acrimony at the start of this decade, the past two years have been a period of calm in the debate over the labeling of genetically modified – now the preferred term is bioengineered, or BE – foods. While mandatory national BE labeling won’t be required until Jan. 1, 2022, a handful of food processors and brand marketers have been making that label declaration for years. And they’re still in business. What will happen after that 2022 deadline is anybody’s guess. Before the national BE labeling law, there was universal fear among the bigger food and beverage processors that disclosing the presence of genetically engineered ingredients – which are estimated to be in 75 percent of all packaged/processed foods – would devolve consumers into hunter-gatherers, eschewing all manufactured foods. That desperate reformulations would create a scarcity of non-GMO ingredients. That smaller “natural” food companies would suddenly rule the world. Armageddon hasn’t arrived yet, and it’s not expected in 2022 either. Some just-published research from University of Vermont indicates that BE labeling, which is prevalent in that state, has not increased the cost of bioengineered foods in Vermont (an early argument against labeling was that new packaging and the tracing of BE ingredients would drive up costs). And the premium for food without a BE label was a mere 5 cents per ounce. Perhaps more importantly, the appearance of labels in Vermont actually increased consumer acceptance of bioengineered foods. More on that later. Nielsen and Label Insight data might indicate otherwise. “Partially produced with genetic engineering” claim: 4,796 products. “Produced with genetic engineering”: 2,973 products. “May be produced with genetic engineering”: 315 products. $23.8 billion in products with some admission that they contain GMO ingredients. That sales figure has declined more than 40 percent since 2016. Why label at all before the federal deadline? Blame or credit the tiny state of Vermont. There were approximately 70 unsuccessful attempts at legislation in the U.S., according to the University of Vermont research. The first referendum was California’s Proposition 37, on the ballot in 2012 (it was defeated 53 percent to 47 percent). It was followed by even closer, but also unsuccessful, referendums in Colorado and Oregon, both in November 2014. A Vermont bill had been winding its way through the state’s legislature since January 2013. Without a referendum or even formally polling citizens, the legislature in mid-2014 voted to require the BE statement, and it set an effective date of July 1, 2016. Despite delays and legal challenges, the law stuck and the second-smallest (by population) state forced BE labeling on multi-billion-dollar, global food companies. Other states looked poised to follow. Nearby states Maine and Connecticut passed labeling requirements contingent on adjoining states adopting similar legislation, so that at least in New England labeling would be consistent across several states. And labeling continued to be discussed in other states. While opposition to labeling, especially by bigger food companies, once was unified and staunch, the Vermont law became indelible writing on the wall. Campbell Soup immediately broke ranks, becoming “the first major food company to announce our support for the enactment of federal legislation to establish a single mandatory labeling standard for foods derived from GMOs,” a spokesperson reminded us. Fearing a patchwork of 50 different state laws requiring BE labeling – and with surging consumer demand for transparency – support grew for a single, pre-emptive federal law, even among bigger food companies and legislators who had opposed the idea. After much debate, a bipartisan bill was passed in July 2016. The “National Bioengineered Food Disclosure Standard” assigned the job of creating a standard for GMO labeling to USDA, not FDA, and established a July 29, 2018, deadline for publishing that rule. The Dept. 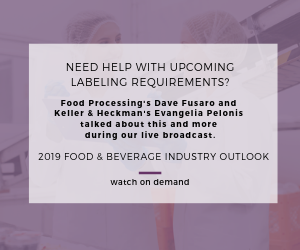 of Agriculture came up with a staged enactment process, whereby processors should begin identifying products they’ll have to label as BE on Jan. 1, 2020, with full compliance – meaning labels – by Jan. 1, 2022. “If you are currently using labels that were in compliance with Vermont’s genetic engineering labeling law, those can be used up until [Dec. 31, 2021], one day before the mandatory compliance date,” says Sam Jockel, an attorney at Keller and Heckman (www.khlaw.com). Formerly, as a counsel at USDA, he assisted with the drafting of the proposed BE rule. Morrison is no longer with Campbell, and perhaps that doesn’t bode well for the transparency effort. But the current spokesperson confirmed, “We provide clear and simple GMO language on the labels of our U.S. products because we believe consumers have a right to know how their food is grown and made. Campbell’s products in the U.S. currently include the statement: ‘The ingredients from corn/soy/sugar/canola etc. in this product come from genetically modified crops.’ "
In mid-2017, one year after BE labels started appearing, a study from the University of Vermont found GMO disclosure labels might not scare consumers as much as was originally feared. In fact, the labels might actually improve their attitudes. Jane Kolodinsky, a professor and chair of the department of Community Development and Applied Economics at the University of Vermont, wanted to see if consumer perceptions had changed since Vermont’s label mandate. She analyzed the responses of consumers who were asked to rank their attitudes about the use of GMOs in food on a scale of 1 (“strongly support”) to 5 (“strongly oppose”) between 2014 and 2017. She then compared those results to a national consumer survey, led by Purdue University economist Jayson Lusk, that asked similar questions. All told, 7,800 people were surveyed. In Vermont, Kolodinsky found opposition to GMO food fell significantly after the labeling law went into effect – by 19 percent. In the rest of the country, where the federal labeling law was not yet in effect, opposition continued to rise. “Mandatory labels providing simple disclosures lead to reductions in opposition,” the study authors wrote. Label declarations are “not likely to signal to consumers that GE [genetically engineered] foods are more risky, unsafe or otherwise harmful than prior to label exposure, and might, in fact, do the opposite.” Where there was real-world exposure to GMO labels, perceptions improved. One of Kolodinsky’s students, Orest Pazuniak, went a step further, to see if BE labeling had any effect on the prices of food products. He just published a master’s thesis titled “Do Labels Make a Difference: Estimating the Impacts of Vermont’s GMO Labeling Law on Perceptions and Prices.” Read the thesis here. “While there are many arguments that emerge from those who oppose labeling, the two most frequent are (1) GMO labels will scare and confuse consumers who will view labels as warnings, and (2) labels will drive up the prices of both GMO and non-GMO foods,” he wrote. There is a general price premium for non-GMO goods (but not including those with the Non-GMO Project certification) of 5 cents per ounce across all states and times. Mandatory labeling laws do not result in a short-term change in quantities sold or prices of GMO products. Both mandatory labeling laws and failed mandatory labeling referendums cause an increase in support for GMOs in the food supply. Other label declarations such as rBST-free, organic or fair trade can result in price premiums, Pazuniak notes. But, “The implications of this research are that mandatory GMO labels did not impact short-term prices or sales and increased the level of support for GMOs. The reason why such research is important is that it can help resolve the debate of whether GMO labels serve as a ‘warning’ or as a ‘guidepost’ for consumers. “If companies using emergent technologies want to improve their relationship with the public and the perception of the new technologies, transparency may be the simplest and most cost-effective approach,” Pazuniak concludes. “On the other hand, if food producers wish to avoid the use of GMO ingredients, then by doing so they can charge premiums for their products of various size depending on the state. If demand for such products is relatively inelastic, and the profits from these premiums are greater than the costs incurred by companies in avoiding GMO ingredients, then a non-GMO niche market can comfortably exist.”?